High growth manufacturers are setting the ambitious goal of having 360-degree views of their shop floors from anywhere in the world, at any time. 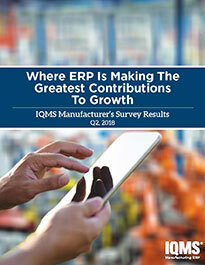 According to a recent survey of North American Manufacturers, ERP and MES solutions are the technology tools that can provide that visibility. 81% of all manufacturers surveyed say real-time monitoring is improving their business today. It’s evident from the survey results that high-performance manufacturers combine analytics and Business Intelligence (BI), mobility, quality management applications, and real-time monitoring to gain clear visibility of their supply chains. Download the survey results for insights into how technology can enable more profitable revenue growth, reduce costs, time-to-market and improve quality for your manufacturing company.